The integration of Riskalyze with Asset-Map Platform creates an unparalleled client and risk profiling solution for financial professionals to facilitate meaningful financial conversations by including Risk Numbers embedded on a household Asset-Map. PHILADELPHIA, PA (PRWEB) NOVEMBER 02, 2016 – Asset-Map and Riskalyze announce the launch of the integration of the Risk Number® into the Asset-Map Platform. Riskalyze invented the Risk Number, a quantitative way for financial professionals to pinpoint how much risk investors want, how much risk they have in their portfolio, and how much risk they’ll need in order to reach their goals. Asset-Map, LLC provides the Asset-Map® Platform, the only household visualization platform that collects an entire client profile on one page to help financial professionals communicate their financial facts and conditions. 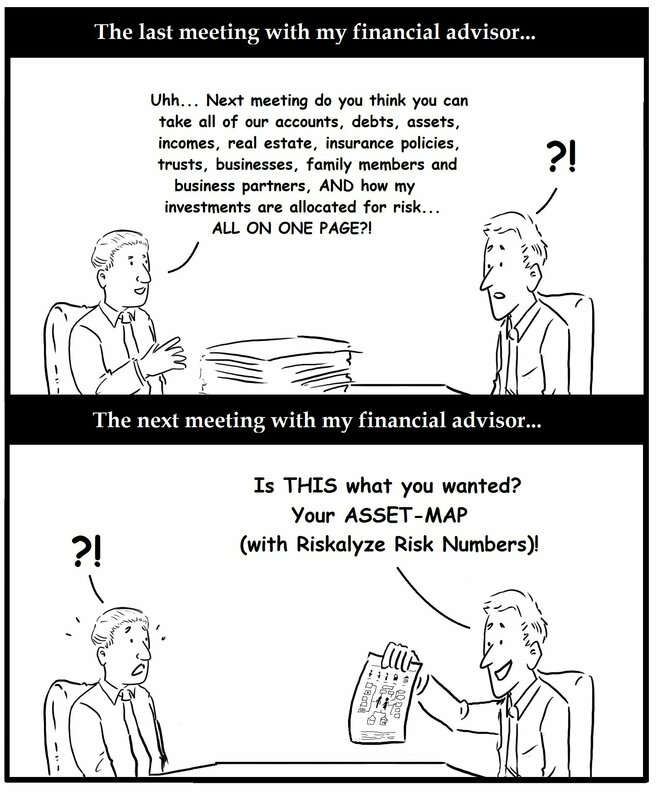 The integration of Riskalyze with Asset-Map Platform creates an unparalleled client and risk profiling solution for financial professionals to facilitate meaningful financial conversations by including Risk Numbers embedded on a household Asset-Map. The Asset-Map Platform has evolved into a practice management and collaboration platform that financial professionals choose to use alongside traditional financial planning tools because it focuses on the critical discovery process — seeking opportunities to serve clients’ best interests. By continuously promoting the asking of good questions in the common meeting formats today (face-to-face paper reports, digital/mobile presentations and remote screen display), the platform enables collaboration among generalist and specialist practitioners in order to uncover financial structural gaps and address clients’ current financial inventories relative to the people and entities that matter most to the household. Asset-Map is a repeatable point-of-sale and customer review experience that doesn’t feel like a typical advisor sales process. By integrating with the Risk Number, Asset-Map expands its unique customer experience that promotes confidence in current condition and risk assessment with clarity of action while promoting an elevated standard of care that clients appreciate. This integration will also set a new standard of best interest advice and customer experience between advisors and their clients and prospects. The combination of Riskalyze and Asset-Map delivers an unmatched front-end solution to address the upcoming DOL Fiduciary Rule. When considering potential DOL solutions, financial advisors should be confident that their process is logical and serves the clients’ interests. Having the Risk Number presented on an Asset-Map helps quantify the best interest standard, elevate the financial professional, scale across demographics, and facilitate an engaging client experience. Riskalyze is the company that invented the Risk Number®, which powers the world’s first Risk Alignment Platform, empowers advisors to execute the digital advice business model with Autopilot, and enables compliance teams to spot issues, develop real-time visibility and navigate changing fiduciary rules with Compliance Cloud. Advisors, broker-dealers, RIAs, asset managers, custodians and clearing firms today use Riskalyze to align the world’s investments with each investor’s Risk Number. To learn more, visit http://www.riskalyze.com. Founded by successful financial advisors, Asset-Map® delivers practice management solutions transforming the advisor-client relationship by visually facilitating meaningful financial conversations. The Asset-Map Platform is a cloud-based and professionally branded SaaS, enhancing an advisor’s customer experience through the most common meeting formats today: using paper, computers, tablets or through remote online meetings. Advisors choose to use Asset-Map because it provides the next-generation of a continuous discovery process for opportunities to suitably serve their clients. Financial Professionals, broker-dealers, RIAs, insurance agents and agencies have mapped over $340 billion in financial instruments on the Asset-Map Platform. To learn more, visit http://www.asset-map.com.